Within the Mathematics department we aim to challenge every student to reach their full potential in mathematics. The Mathematics department is staffed by seven fully qualified mathematicians. The department has its own suite of rooms, with interactive whiteboards and access to a fully equipped ICT area. 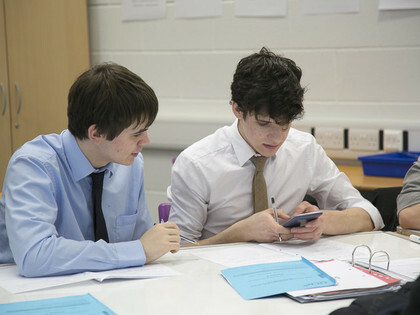 There are three Mathematics groups - two general A-Level Mathematics groups and one Further Maths group. All students sit the AS Level exam at the end of Year 12. A Level homework is set after every lesson as a combination of exercises from the course textbooks and from past examination questions. The department send a number of selected students to St. Paul's independent school, Master Classes in Mathematics, a two year course . We also take part in Kingston's University Master Classes in Mathematics, a six week course. We also send student to the Royal Holloway University ‘Exploring Maths’ – aimed at Year 12 students considering choosing a Maths based degree at university. Mathematics is a powerful tool with many applications. Advanced mathematical training can lead to many career opportunities, including business, finance, medicine, engineering, and basic sciences. At the same time, mathematics is a self-contained subject that is worth studying simply for its elegance. While challenging at times, the study of mathematics can bring a tremendous sense of accomplishment. Mathematics is an ideal subject for people who enjoy abstract thinking.